Depending on what you are looking for on a Holiday in Belgrade, as well as other tourist destinations in Serbia, offer many holiday entertainments suited to your interests and needs. There are many things you can learn about Belgrade, its history, culture and the beautiful modern lifestyle of this city, as well Belgrade is a suitable for people who are looking for an active holiday or a tour through the some of the most famous Belgrade attractions. Happiest time of a year is Summer time and definitely around New Year’s EVE. 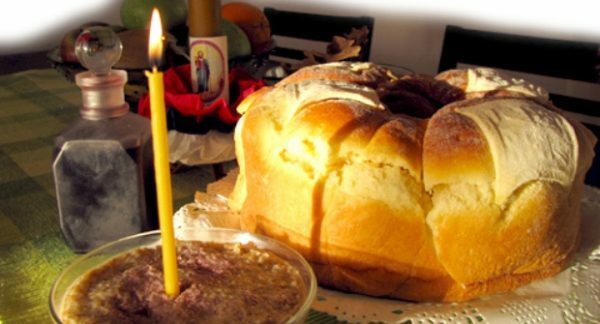 It is already enough to say that winter is time of Slava, Serbian “feasts” – tradition of the ritual glorification of one’s family’s patron saint, so if you have friends in Serbia, now is the time to visit them. Most families have a patron saint, and the saint’s day (called Slava) is traditionally celebrated every year. Also, many institutions, cities and villages have a patron saint that they celebrate. This traditional holiday is usually the day for families to gather, and guests are welcome to join the celebration. If you have a chance, don’t miss an invitation to a Slava. Some of the most common patron saints include St. Nicholas, St. George, St. John and St. Demetrius. In many families, lunch on this day is the most important meal. The whole family gathers around to eat, and lunch usually includes various types of traditional food. Before you sit down to eat, the hosts will serve an aperitif (probably the most famous traditional drink – rakija). The tradition is to clink your glass against everybody else’s and say Živeli! ( Cheers in Serbian) before you drink. When coming to somebody’s home for the first time, it is customary to bring a small gift as a sign of gratitude for the hosts, but it is not necessary. In this occasion, polite is to bring bottle of wine. People in Serbia greet each other by kissing three times on the cheek, and shaking hands. During the winter, City is lighted up in colorful and joyful Christmas lights. While in town, check the best restaurants in Belgrade. During winter Holidays, main events are on the Republic Square in the center of the city, and program starts few days before New Year’s Eve. Something that you didn’t know is that beside New Years EVE on the 31st of December, in Serbia we celebrate Orthodox New Years Eve as well. The Ortodox one is smaller one and it is not celebrated as much as one on 31st of December. Ortodox New Years Eve is scheduled for 13th of January. While the most of the world is celebrating Christmas on 25th of December, in Serbia, considering it’s Orthodox Christian country, Christmas takes place on 7th of January. This is great opportunity for many tourists to experience 2 Christmas celebrations in one year. Orthodox Christmas in Belgrade is one of the most traditional you can imagine. People are spending Christmas Eve with their friends and family, and traditionally after dinner, all together go to the church to welcome Christmas at midnight. And than, an Orthodox priest places the Badnjak on the fire during Christmas Eve celebration exactly at midnight. The Badnjak is an oak log or branch brought into the house and placed on the fire on the evening of Christmas Eve, much like a yule log in other European traditions. There are many regional variations surrounding the customs and practices connected with the Badnjak. 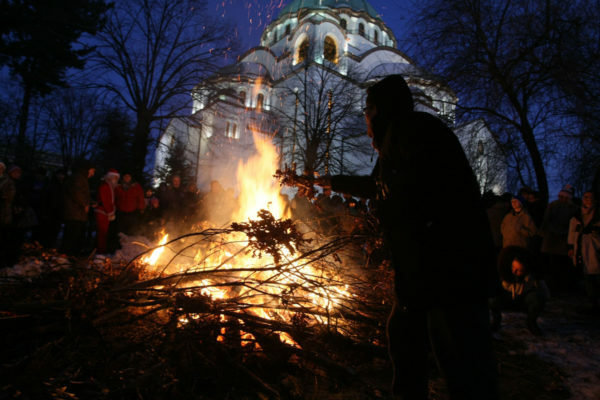 Putting Badnjak on fire during Christmas Eve is something unique and traditional and beautiful to participate if you are staying in Belgrade during the holidays. And the best is yet to come. After summer clubs, best parties are on the 31st December, for the New Year’s Eve. Almost everyone are going to be in the some of the popular winter clubs, partying like never before. On the evening of 1st of January Belgrade Nightlife is going to repeat: another great parties, because we like to celebrate twice for the same reason! 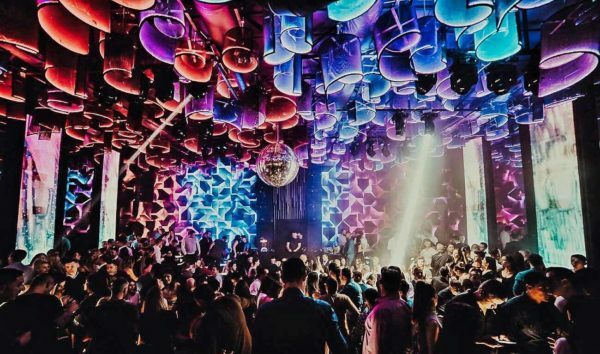 Nightlife in Belgrade is flying to the next level: All the best clubs in Belgrade are throwing the best events and party at the end of December, so it is time to reserve your ticket to our capital. Events in clubs is different during the holiday season. For more info WhatsApp us on +381 62 33 77 00.